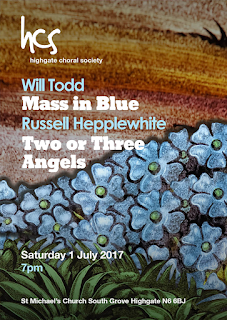 Highgate Choral Society, conductor Ronald Corp, is performing Will Todd's Mass in Blue on Saturday 1 July 2017, at St Michael’s Church, South Grove, Highgate, London N6 6BJ. Rather imaginatively they have commissioned the young composer Russell Hepplewhite to write a new piece as a companion. Hepplewhite's Two or Three Angels is for soprano (Susannah Fairbairn) and double choir accompanied by piano quartet, and sets poetry by William Blake, Rabindranath Tagore, Emily Dickinson, W B Yeats, Stephen Crane, James Henry Leigh Hunt, John Keats and Henry van Dyke. Will Todd's Mass in Blue has been a classic almost since it debuted in 2003, and let us hope Russell Hepplewhite's new companion piece proves just as popular. Russelly Hepplewhite's name will be familiar to readers of this blog as he has written an impressive series of family operas for English Touring Opera (the most recent, Silver Electra about Amelia Earhart, see my review) plus The Price, about the Suffragette Movement, for W11 Opera (see my review). 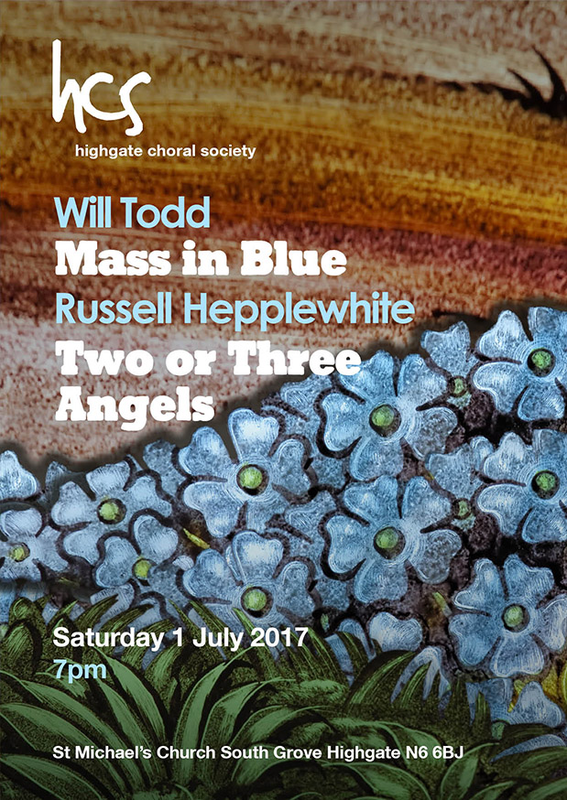 Full information from the Highgate Choral Society website.